At RHHS, all students utilize a chromebook/computer as a part of their daily academic experience that is either brought from home or provided by the school. Students who utilize a school provided chromebook are afforded technical support and return these devices every summer as well as at the end of their tenure at RHHS. Students who provide their own device are not provided technical support or our loaner system but do get to keep their devices at all times. 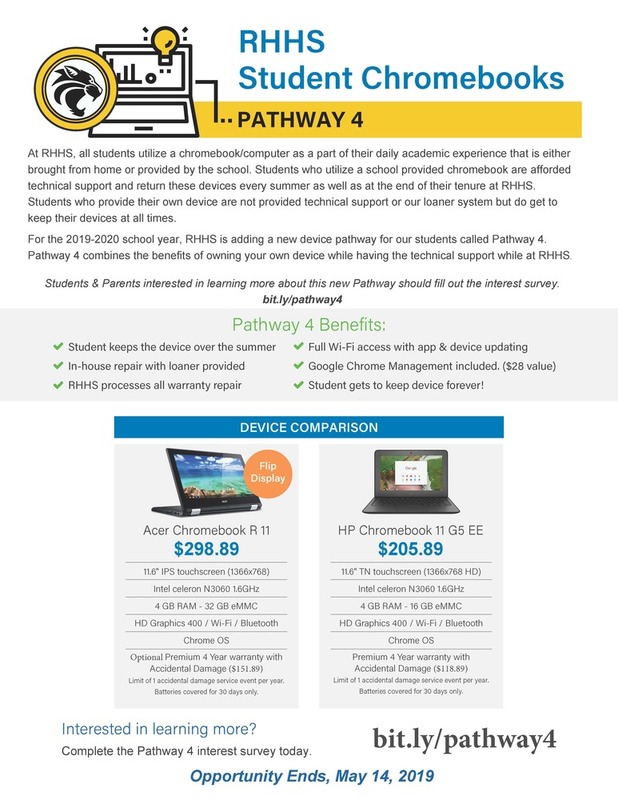 For the 2019-2020 school year, RHHS is adding a new device pathway for our students called Pathway 4. Pathway 4 combines the benefits of owning your own device while having the technical support while at RHHS. Students & Parents interested in learning more about this new Pathway should fill out the interest survey. FAQs will be addressed in the Interest Survey. The Interest Survey also provides a means to email other questions you may have, and by using that form you can be sure that your email is not caught in the SPAM filter. Please address all questions through this Interest survey rather than emailing RHMS personnel.